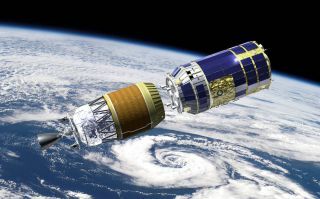 This artist's concept shows Japan’s HTV-5 cargo spacecraft separating from its H-IIB launch vehicle. A robotic Japanese cargo ship will launch toward the space station Wednesday morning (Aug. 19), and you can watch the liftoff live. Japan's fifth H-II Transfer Vehicle (HTV-5) is scheduled to blast off from the nation's Tanegashima Space Center tomorrow at 7:50 a.m. EDT (1150 GMT; 8:50 p.m. local Japanese time). You can watch a webcast of the HTV-5 launch live, beginning at 7 a.m. EDT (1100 GMT), courtesy of NASA TV. HTV-5 is loaded with about 6 tons (5.5 metric tons) of food, water, other supplies and scientific hardware, including equipment for the ongoing "twins study" NASA is carrying out with the help of astronaut brothers Scott and Mark Kelly. Scott Kelly and Russian cosmonaut Mikhail Kornienko arrived at the space station in March, kicking off the first-ever yearlong mission aboard the orbiting lab. The project should help pave the way for human missions to Mars and other far-flung destinations, NASA officials say. As part of the yearlong mission, researchers are comparing how long-duration spaceflight affects Scott Kelly, using his identical twin, Mark, who is on the ground, as a control. HTV-5 is also toting 14 Earth-observing "Dove" cubesats built by San Francisco-based startup Planet Labs. These tiny satellites will eventually be deployed from the space station, joining dozens of other Doves to provide high-resolution imagery of our planet to a variety of customers. Also aboard the Japanese freighter is the Calorimetric Electron Telescope (CALET), an instrument that will hunt for signs of elusive dark matter and characterize high-energy cosmic rays, which can pose a radiation threat to astronauts, NASA officials said. The HTV is one of four robotic spacecraft that currently resupply the space station, along with Russia's Progress freighter and the Dragon and Cygnus vehicles, which are built by American companies SpaceX and Orbital ATK, respectively. SpaceX holds a $1.6 billion NASA deal to fly at least 12 resupply missions using Dragon and its Falcon 9 rocket, while Orbital's $1.9 billion contract is for eight flights with Cygnus and a rocket called Antares. The HTV, Progress and Cygnus are designed to burn up in Earth's atmosphere at the end of their cargo missions, while Dragon makes a parachute-aided splashdown in the ocean when its time in space is done. HTV-5 was originally supposed to launch on Sunday (Aug. 16), but bad weather has forced several delays. Editor's note: Visit Space.com early Wednesday for complete launch coverage of Japan's HTV-5 mission.